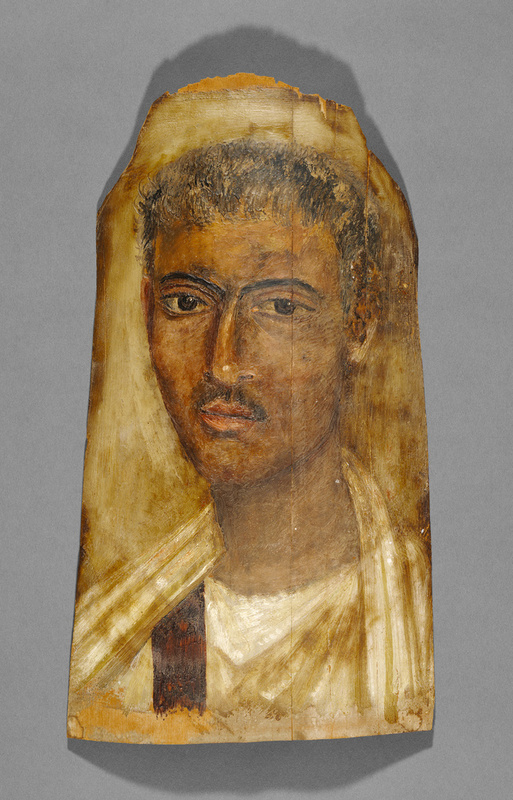 The young man in this Romano-Egyptian mummy portrait turns his head slightly to his left, thoughtfully gazing into the distance. His short hair and faint moustache suggest that the portrait was painted in the period from about A.D. 100 to 125, when these fashions were in style. Although scholars are not certain, several elements of this portrait indicate its place of origin. The turn of the man's head toward the viewer, the width of the stripe on his tunic, and the way the cloak drapes over his shoulders, as well as the rounded form of the top of the panel itself, find numerous parallels in portraits known to come from the site of Hawara. Hawara was the cemetery of nearby Arsinoe, the main city in the Fayum, where the man in this portrait may have lived. Robin Symes, Limited (London, England), sold to the J. Paul Getty Museum, 1971. Robin Symes advertisement. Apollo 91 (February 1970), p. xxxv, ill.
"Notable Works of Art Now on the Market: Supplement." The Burlington Magazine 112, no. 813 (December, 1970), n.p, pl. IV. Symes, Robin. Ancient Art (dealer cat.). (London: n.p., 1971), no. 25, color pl. Thompson, David L. "A Patchwork 'Fayum' in Toledo." American Journal of Archaeology 77 (1973), pp. 438-439, p. 439, n. 4. Vermeule, Cornelius, and Norman Neuerberg. Catalogue of the Ancient Art in the J. Paul Getty Museum (Malibu: J. Paul Getty Museum, 1973), p. 41, no. 91, ill.
Los Angeles County Museum of Art. Age of the Pharaohs: Egyptian Art from American Collections: An Exhibition Checklist for Students, exh. cat. (Los Angeles: Los Angeles County Museum of Art, 1974), no. 90. Thompson, David L. "Four 'Fayum' Portraits in the Getty Museum." The J. Paul Getty Museum Journal 2 (1975), pp. 85-92, pp. 85-88, no. 1; fig. 1. Thompson, David L. The Artists of the Mummy Portraits (Malibu: J. Paul Getty Museum, 1976), p. 8, fig. 11. Parlasca, Klaus. Ritratti di Mummie. Repertorio d'arte dell'Egitto greco-romano. 2 ser. Vol II. (Roma : "L'Erma" di Bretschneider, 1977), p. 34, no. 267. Thompson, David L. Mummy Portraits in the J. Paul Getty Museum (Malibu: J. Paul Getty Museum, 1982), pp. 34-35, ill.
Borg, Barbara. Mumienporträts: Chronologie und kultureller Kontext (Mainz: Ph. von Zabern, 1996), p. 74.